As I've mentioned before, I love pretzels. They're just so versatile! So when I heard about the wonder that is Kim & Scott's, I just HAD to try them out! Imagine a unique twist to your grab-and-go meal! Kim & Scott's offers an assortment of amazing, ready-to-heat pretzels, using ALL-NATURAL and PREMIUM ingredients, like freshly shredded cheeses, hearty spices, unbleached flour and whole grains. They combine a traditional European recipe with their own special twist, creating a truly handmade soft pretzel that is great for breakfast, lunch, or dinner! My personal favorites are the grilled cheese stuffed pretzel & the Chocolate Crumb. 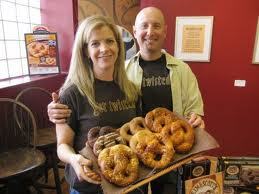 Every Kim & Scott's pretzel that I've tried has been moist, tasty, soft and filled with wonderful flavors & fillings! "We met at a Chicago book signing by a wondrous author, Richard Bach, who writes about soul-mates and airplanes. We decided to express our joy by flying high together inside a passionate soft pretzel business and nurture the world with our deliciously twisted and inspired products. You can buy Kim & Scott's Pretzels Online or use the handy Find A Retailer page. You can connect with Kim & Scott's Pretzels in a variety of different ways! *Kim & Scott's Pretzels sent me some pretzels for review. I received no monetary compensation in exchange for this review. These opinions are my own. Thank you to Kim & Scott's! Hello from your new follower from Monday mingle blog hop.